Some embedded fonts cannot be installed – what to do? Some of the embedded fonts in your presentation cannot be installed. 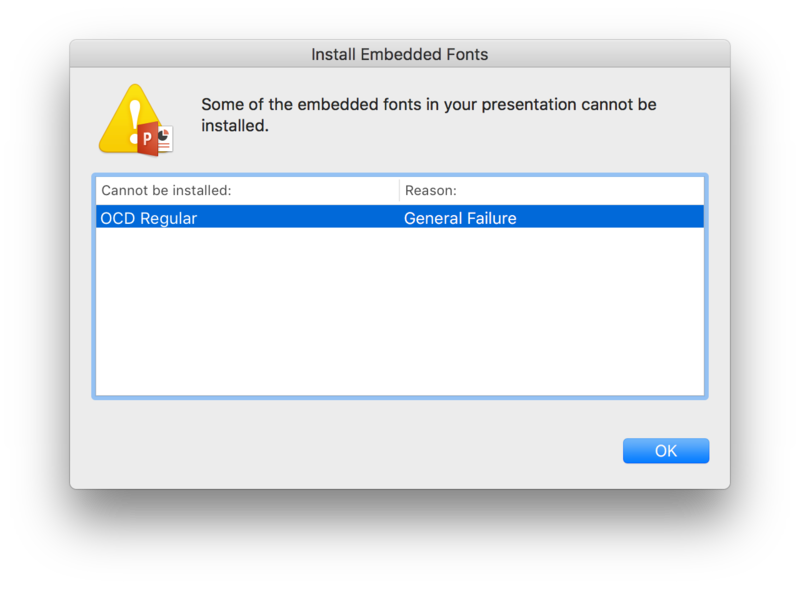 In some versions, this is followed by a list of fonts that PowerPoint claims cannot be installed and the reason behind the failure for each of the fonts. The given reason is usually Font installation failed, or General Failure. To put it simply, the presentation that you are trying to open contains actual font files inside of it. PowerPoint tries to temporarily install these fonts so it could use them to display the text in the presentation, but it fails. If you are on a Mac, the appearance of this notice is not a big surprise. PowerPoint for Mac just doesn’t support display of fonts that are embedded this way. The language may not be straight forward, but this is how PowerPoint for Mac warns you that the presentation that you are opening will display using default system fonts, instead of the ones that the designer used. Continue reading to see what you can do. It could be that the presentation file is corrupted and that the fonts cannot be extracted from it. Re-download or obtain another copy of the file and try again. The fonts were created for a newer version of Windows or PowerPoint than the one that you are using. Try to open the presentation using the latest versions of Windows and PowerPoint. In both cases, one of your options is to dismiss the window by pressing OK. This will let you see the presentation, but some (or all) of the text will be displayed using system default fonts – not the fonts that the designer intended. I want to see the fonts the designer used – what can I do? Get the fonts in question separately, and install them locally on your computer. Note that if commercial ones were used, you will probably have to pay for them. Or, you can ask the designer to use Presentation Font Embedder (if they use a Mac, they would want to choose Universal as their embedding method). Presentation Font Embedder uses a different method for embedding fonts. Instead of inserting font files into presentation files, which cannot be displayed on Macs (nor on iPhones or iPads by the way) and can be very picky about what fonts can be embedded, Presentation Font Embedder renders the texts as images, while keeping most animations and transitions intact. This is the only method that ensures that the presentation appears in the highest fidelity and with no font related pop-ups.